Know your rights when returning from Mecca. Every year, thousands of Americans travel to Mecca for Hajj. But the Muslim ban has created additional confusion and increased problems at U.S. borders and airports, with travelers facing religious-based questioning, seizure of electronics, and prolonged detentions. While Saudi Arabia is not officially listed as a designated country under the Muslim ban or explicitly subject to extreme vetting, there have been reports of American Muslims being discriminated against by airport and customs officials. Click here for the full fact sheet. Muslim Advocates has a confidential and secure online reporting form. 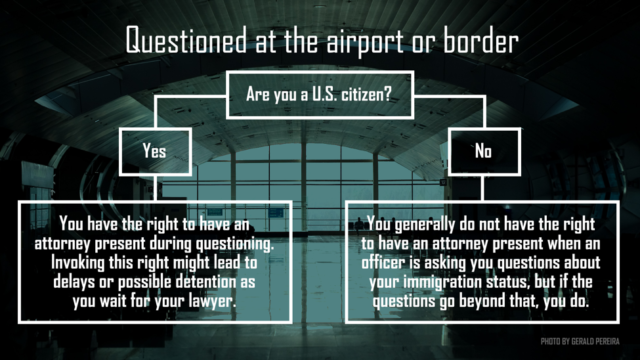 Regardless of your immigration status, your race or religion cannot be used as a justification for questioning or searches. If you feel like you, your family member, or someone you know may have been discriminated against, try to obtain the officer’s name, number, and other identifying information, and complete our secure and confidential reporting form here or call us at 202-897-1897.